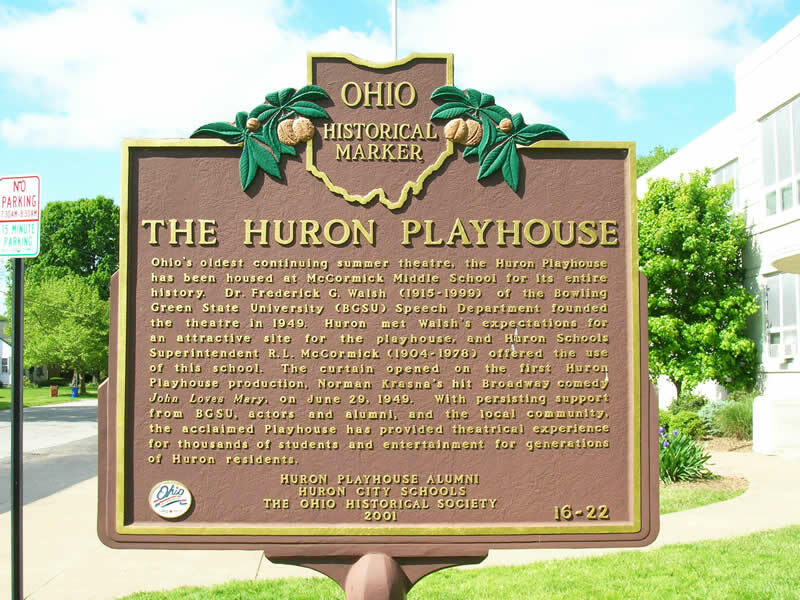 Ohio’s oldest continuing summer theatre, the Huron Playhouse has been housed at McCormick Middle School for its entire history. Dr. Frederick G. Walsh (1915-1999) of the Bowling Green State University (BGSU) Speech Department founded the theatre in 1949. Huron met Walsh’s expectations for an attractive site for the playhouse, and Huron Schools Superintendent R.L. McCormick (1904-1978) offered the use of this school. The curtain opened on the first Huron Playhouse production, Norman Krasna’s hit Broadway comedy “John Loves Mary”, on June 29, 1949. With persisting support from BGSU, actors and alumni, and the local community, the acclaimed Playhouse has provided theatrical experience for thousands of students and entertainment for generations of Huron residents. McCormick Middle School, 325 Ohio St.